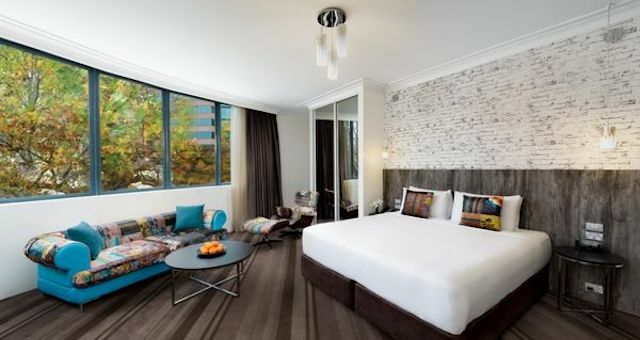 Rydges Sydney Central has completed its multi-million dollar renovation with 271 refurbished rooms and 38 new rooms and suites across the property. The hotel’s interiors now have a contemporary urban feel, reflective of the Surry Hills location, and two new floors have been added to create a variety of executive rooms and corner suites. With a focus on improving in-room efficiency, convenience and technology, guests can expect upgraded features to enhance their stay. Smart, energy efficient room controls have been installed in every room allowing sensors to track when guests enter and depart rooms and powering electricity accordingly. Each room now offers USB points installed throughout key locations in the room, brand new 49 inch LED/LCD TV’s and an upgraded movie streaming service. In addition to the refurbishment of rooms across the property, Rydges Sydney Central’s dining, pool and gymnasium offerings have also been refreshed with renovated designs and technology upgrades. Located near Central Station, Rydges Sydney Central offers a prime location in the heart of Surry Hills’ trendy dining precinct and will soon become the urban home of Sydney Brewery Surry Hills, the latest micro-brewery to hit Sydney’s inner city in July.